A Celebration of the Legacy of Vail! A celebration of the legacy of Vail, commemorating it’s founders from the 10th Mountain Division this Friday.! 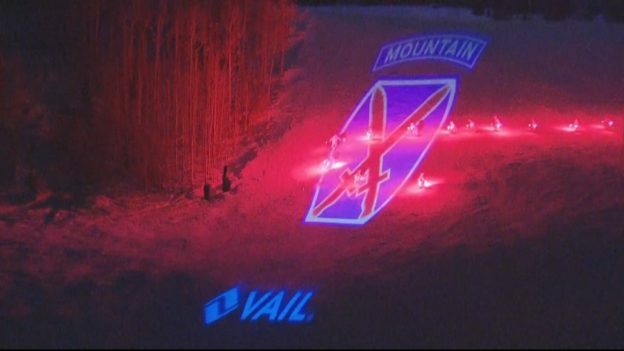 January 18, 2019 at 6pm, the side of Vail Mountain will light up with the iconic 10th Mountain Division logo as skiers dressed in traditional ski trooper uniforms, led by torchlight, will make their way down to the base of Gondola One. From there, a parade of military veterans in uniform, will march down Bridge street, over the covered bridge, and conclude at the 10th Mountain Statue. Leading the parade is Sandy Treat, now 95 years young, a 10th Mountain Division veteran from Camp Hale. A celebration of the rich history of Vail and what started much of the Colorado ski industry today! There will also be a feature film showcasing the history and legacy of Vail projected at the base of Gondola One. Along with extended hours of the newly renovated Colorado Snowsports Museum for guests to learn about Colorado’s ski history. Vail would not have become what it is today without the 10th Mountain Division! Fun for the whole family, photographers will be available for guests to take pictures with the soldiers. Come early there will be a limited number of Legacy of Vail pins given as well as hot cocoa! If you can’t make it, come to one of the additional dates February 15th or March 8th! This entry was posted in Activities & Events on January 17, 2019 by Karen Oberholtzer.